These numbers reflect estimated student expenses for the 2018-2019 school year. Amounts will change slightly from year to year, but as the cost of college increases, the scholarship packages will correspondingly increase. Your official financial aid award will be included in a letter directly from UVA. Since the University of Virginia provides QuestBridge College Match Scholarship Recipients with an all-grant package to cover the full cost of attendance (i.e., tuition, fees, room, board, books and supplies, personal expenses, and travel), outside funding will reduce University of Virginia grant funds dollar for dollar. The University of Virginia requires all students to have health insurance, either through their parents’ or another plan. If the student is not covered by a parental plan, the University will increase the QuestBridge grant amount to cover the cost of student insurance. For all students, a travel allowance is included in the budget and covered with grants. The travel allowance represents the estimated cost of two round trips to the University during the academic year. Travel cost varies by geographic region. Students must maintain Satisfactory Academic Progress, according to the standards and practices of the University. Students who fail to maintain satisfactory progress may not receive federal Title IV assistance or state and University need-based grants and scholarships. The University of Virginia expects all students to adhere to the University Honor Code. AccessUVA, the University of Virginia's financial aid program, is designed to keep higher education affordable for all admitted students regardless of economic circumstance. The University of Virginia community believes that educational equality is not only about equal access to higher education but access to the best education in all its forms. We believe that students should be able to take advantage of superior academic programs as well as co-curricular opportunities, study abroad programs, leadership roles, and service learning to enrich themselves and the community. The University wants each admitted student to be a part of the UVA experience, regardless of economic circumstance. The University of Virginia is committed to awarding aid based on financial need determined by a thorough review of each family's financial circumstances. The Expected Family Contribution (EFC) is calculated using federal guidelines and University policies and is based on information submitted on the Free Application for Federal Student Aid (FAFSA), the CSS Profile, and additional documents submitted to UVA. The EFC has a parent and a student component based on income and assets, which include cash, checking, savings, and money market accounts; investments and real estate holdings other than the primary residence; untaxed income; and business equity. Aid applications must be renewed every year. The University of Virginia meets 100% of demonstrated need with need-based aid consisting of loans, work-study and grant aid. For QuestBridge College Match Scholarship Recipients, UVA provides a generous all-grant package to cover the full cost of tuition. The scholarship described above will be renewed for four years of study for College Match Scholarship Recipients pending a review of Satisfactory Academic Progress. Students will need to submit the FAFSA and CSS Profile each year. Need-based financial aid, but not QuestBridge funding, may be available for students who elect to attend summer sessions. Summer aid packages, however, generally include student loans. For additional information, visit UVA's financial aid website. 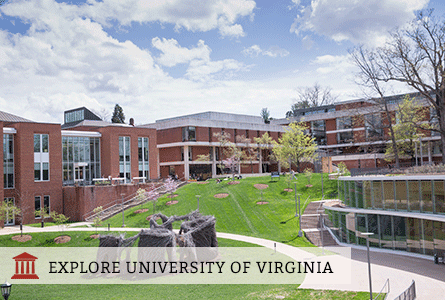 University of Virginia meets 100% of demonstrated need with need-based financial aid. Learn more about financial aid here.